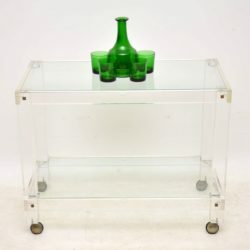 A beautiful and rare vintage Italian drinks trolley, this was made by Zevi in the 1970’s. 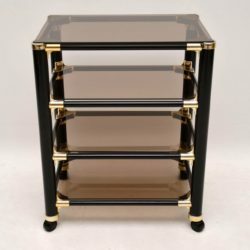 It’s made from brass plated aluminium, with removable glass shelves. The condition is excellent for its age, with only some extremely minor wear here and there. The glass shelves have one or two tiny and shallow chips on the corners, these are not visible at all when the shelves are in place. 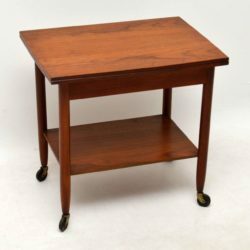 A stunning and very rare vintage teak sewing table on wheels, this was designed by Povl Dinesen, it was made in Denmark during the 1960’s. We have had this stripped and re-polished to a very high standard, the condition is superb throughout. 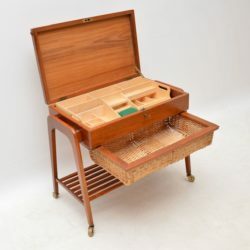 It has a lockable top section with a removable compartment tray, with a wicker tray drawer that pulls out from beneath. There is also a useful lower tier, this rolls smoothly on wheel and is beautifully finished on the back too. 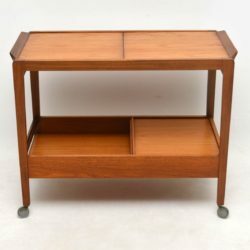 A stunning and rare vintage Danish drinks trolley in teak, this was designed by Arne Hovmand-Olsen, it was made by Mogens Kold. 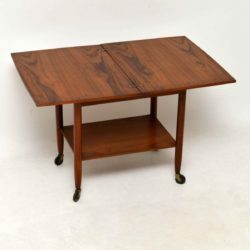 It is super quality, has a beautiful and striking design, the condition is superb throughout. We have had this stripped and re-polished to a very high standard, the Mogens Kold badge can be seen beneath the top. 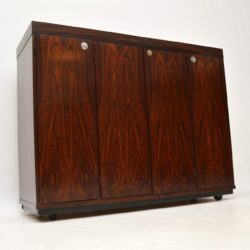 A superb and rare vintage drinks cabinet / serving bar in rosewood, this was made in Denmark by Dyrlund, it dates from the 1960’s. 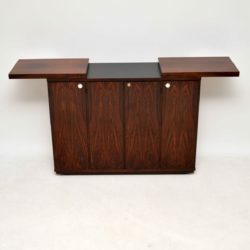 It has stunning rosewood grain patterns throughout, even inside the cabinets and on the back. The condition is superb for its age, with only some extremely minor wear and fade here and there. The top slides apart in the middle to reveal a black formica serving area. 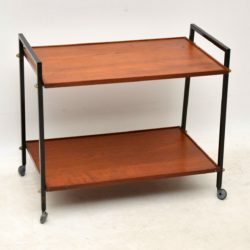 The interior contains several tray slide shelves with green base lining, and ample storage space. The original locking key comes with this to lock the central cabinet, and this rolls smoothly on casters. 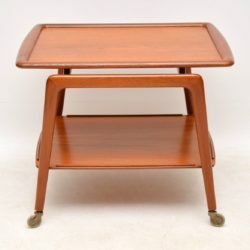 A stylish and very well made Italian vintage side table on wheels, this dates from the 1970’s. 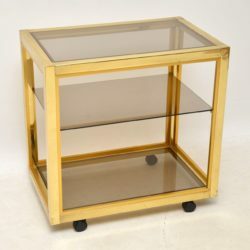 It’s an unusual and useful design, it’s quite small and compact with four removable glass shelves. 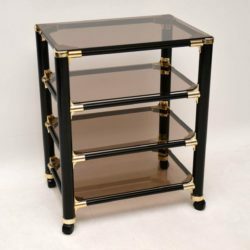 The frame is ebonised aluminium with brass trim, the condition is very good for its age, with only some extremely minor surface wear here and there. 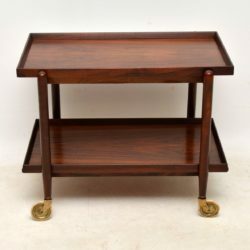 A stunning and extremely well made vintage Danish drinks trolley in rosewood, this was designed by Poul Hundevad, it dates from the 1960’s. The top tray slides across, and the bottom tray can then be lifted on to the top surface to effectively double the space, or to be used as a separate serving tray. The condition is excellent for its age, with a lovely colour and beautiful grain patterns throughout; there is only some extremely minor wear to be seen. 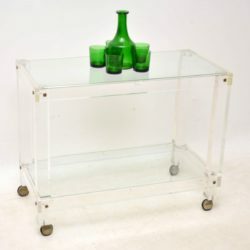 A superb vintage drinks trolley from the 1970’s, probably made in either France or Italy. 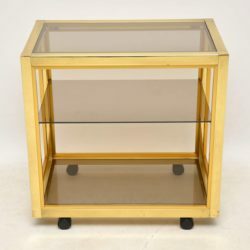 It has a thick clear acrylic frame, accented with brass, and clear glass shelves. 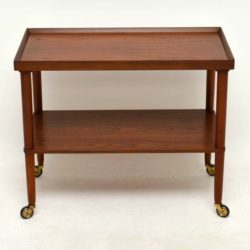 The condition is excellent for its age, with some minor wear to the acrylic here and there; all is clean and sturdy. 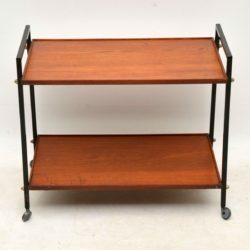 A very stylish vintage drinks trolley in teak, with an ebonised metal frame. This dates from around the 1960’s, it is well made and in very good condition for its age, with only some extremely minor wear here and there. 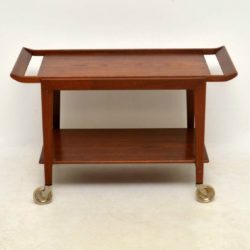 A stylish and very well made vintage drinks trolley in teak, this was designed by Tove & Edvard Kindt-Larsen, it was made in Denmark during the 1960’s. 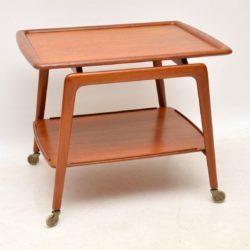 It has a lovely design, the top tier has handles on either end and lifts off to be used as a serving tray. The condition is very good for its age, there is some minor wear to the polish and a few small marks here and there, normal for age. 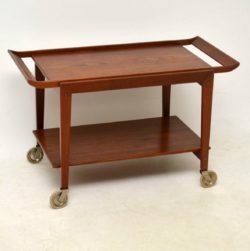 A stylish and practical vintage drinks trolley in Teak, this dates from the 1960’s. It is in excellent condition for its age, there is just some extremely minor wear and one or two very small marks here and there. 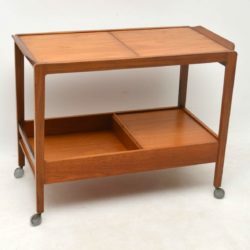 The top slides apart in the middle to reveal a formica serving area. The lower section has a built in draw on one side, the other side has a recess for storing bottles and glasses. 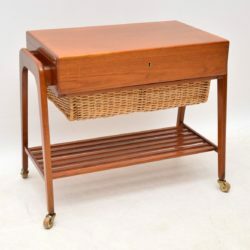 A stylish and practical vintage drinks trolley in Teak, this was made in Denmark and it dates from the 1960’s. It’s in great vintage condition, with some only minor wear to be seen on the polish on the top surface. 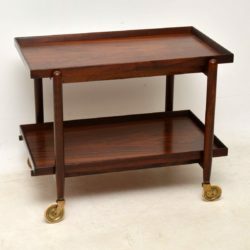 A lovely vintage drinks trolley in Teak, this was made in Denmark and it dates from the 1960's. It's in great vintage condition, with some minor wear to be seen here and there. 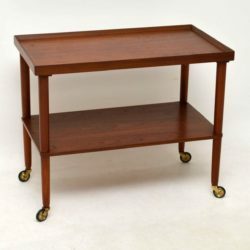 The top swivels and flips open to double up in size, and this rolls on casters.